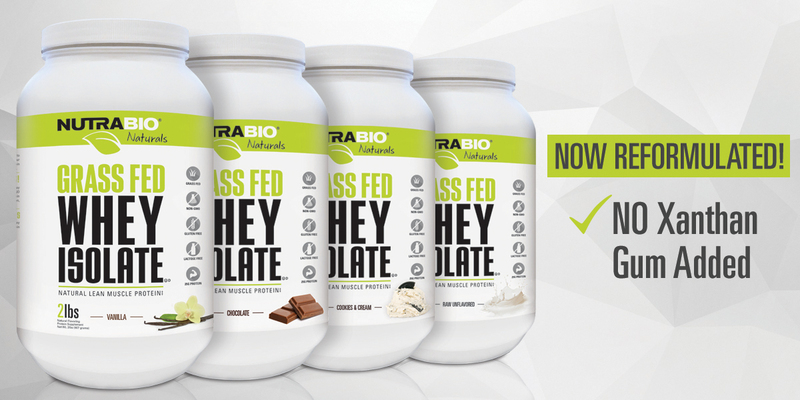 NutraBio Enhances New Grass Fed Isolate! NutraBio is just getting started with our NutraBio Naturals line! As we always do we make our products better and better, cleaner and cleaner. That is our promise to you and we always stay true our values. In typical NutraBio fashion, we have made our New NutraBio Naturals Grass Fed Whey Isolate even cleaner by removing the Xanthan gum. This product is now gum free and as clean as any whey on the market if not cleaner. I bought jars of grass fed whey a couple of months ago. If they have xanthan gum, can I exchange them for the new reformulated whey protein? If you purchased them from a retail location or website other than NutraBio.com, you will need to make returns according to that location’s return policy. If you purchased them through the NutraBio.com website, please contact our Customer Care Center. Your ingredient list for the Vanilla flavor still has the gum in it. Is this a typo or do you still have some of the old formulation left in this flavor? Hi Natalija….the gum has been removed from our Grass Fed Whey Isolate.